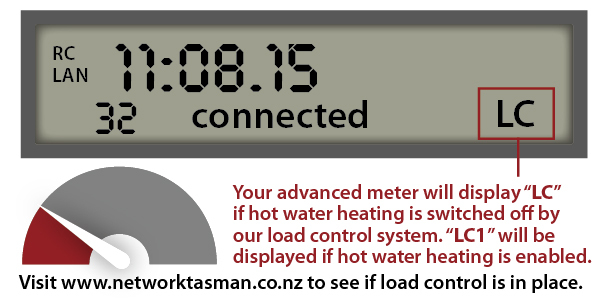 Load control is a mechanism that Network Tasman and many other lines companies use to manage the demand that heating water places on the electricity network during ‘peak’ demand periods, typically in the morning and early evening on the coldest winter days. Load control allows Network Tasman to shut off devices such as electrical hot water cylinders for a short time, using a ripple control system, then switch them back on during low-demand ‘off-peak’ periods. As a result Network Tasman can keep costs down and pass those savings on to our consumers. Cheaper prices for water heating are shown on your electricity bill as a line called ‘controlled’ or ‘economy’. Controlling the load in this way doesn’t impact on the way you use your hot water e.g. to wash your dishes, do laundry or have showers and baths. Our aim is to ensure that you don’t even notice that load control is being used. Load control helps save consumers money because it reduces the transmission charges that Network Tasman pays to Transpower. Network Tasman also doesn’t have to invest so much money upgrading the capacity of its local network to cope with ever-increasing peaks during network busy hours. “As an example,” says Network Tasman’s Regulatory and Commercial Manager, Emma Lanigan, “in the next five years we will need to build a new grid exit point in Brightwater. If we didn’t have load control, we would have needed to make this $28 million investment approximately 6 years earlier and customers would already be paying for that investment in their power bill. “Deferring investment keeps our network at a level that’s in line with what the community actually needs and, in turn, keeps electricity prices down. It also means we can take advantage of developing technology and innovation as alternatives to traditional network supply become available.